In the time of Renaissance artisans, foiling was a technique to add shavings of silver to the walls and ceilings of the most regal of residences. In our modern times, we can add that galore to every event with our family of Ice Chargers. The silver rim adds a flawless amount of accessory to your tabletop décor. Our Silver is a subtle reflective with just a dash of sterling…a gray in the center of all grays. 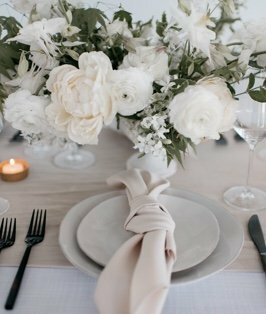 With the clear center, you can relish in the table linen found underneath, or add a menu to complete your vision. And don’t forget, our chargers are crafted to be food safe, so you can use them within your design, as well as in your food service.